Rock 'n' Roll Paradise is a jam-packed show, where the music plays the leading role taking audiences on a rock and roll-a ride through those great days of the 50's and 60's. The incredibly talented cast bring to life the spirit of the rock 'n' roll era, reminding us why this music has stood the test of time. Peter Gill brilliantly captures the energy of Jerry Lee Lewis firing on all cylinders, with hits such as Great Balls Of Fire and Breathless. The evening’s compere is non other than the mighty Big Bopper, so be prepared for witty banter and stunning versions of Chantilly Lace and of course Helllooooo Baby! John-Simon Rawlings brings all the warmth and charisma to the role of J.P. Richardson, The Big Bopper that one would expect given his West End pedigree. Feel the shivers in your spine as Lars Young soars through Roy Orbison classics, Only The Lonely and Pretty Woman. Cheer on Gavin Stanley as Eddie Cochran, performing Summertime Blues, Three Steps To Heaven and C'mon Everybody. Buddy Holly is fondly remembered, with Spencer Jordan filling the infamous glasses and taking us back to Peggy Sue, Oh Boy and That'll Be The Day. The second half opens with a concert within a concert as we're taken through the years of Elvis' later tours, complete with Vegas jump-suits, belts and rings. Richard Atkins is widely regarded as the best late-period Elvis there is. To finish the show we go back to the original guitar heroes as Buddy, Eddie and The Big O once again take to the stage with Big Bopper, Jerry Lee Lewis and Elvis building to fever pitch, leaving the audience demanding more. This is rock 'n' roll music at its very best played with all the commitment and honesty that the originals would be proud of. Behind the front men the Paradise Band are themselves some of the best live musicians you will see anywhere in the UK. 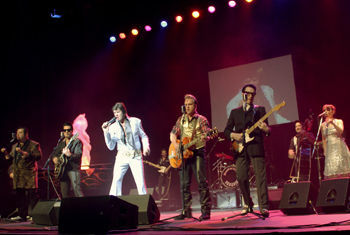 Each has a passion for rock ‘n’ roll and have worked with many household names through their careers including; Helen Shapiro, Suzy Quatro, Bee Gees, The Sweet, Cockney Rebel, Wet Wet Wet, Marty Wilde and The Cavaliers. Brought to you by Lord Tim Croxford of Accelerator Entertainments, it is a spectacular celebration of rock 'n' roll music, performed and enjoyed by the cast so that the audience can participate and take a step back in time to a very special era. Rock 'n' Roll Paradise is, quite simply, the very, very best!